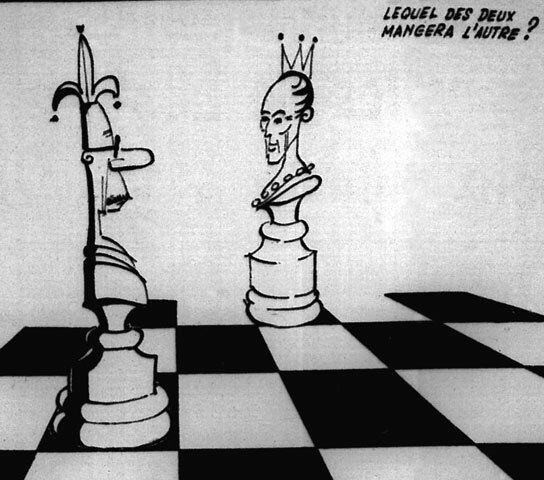 This caricature illustrates the rather strained relations between Quebec Premier, Daniel Johnson, and the Minister of Justice in Ottawa and future Prime Minister of Canada, Pierre Elliott Trudeau. The protagonists are depicted as chess pieces facing off on a chess board. The caption reads: Who will capture who first? During the 16 years that the Union nationale was in power from 1944 to 1960, relations between Quebec and the federal government were stormy, at best. In the name of provincial autonomy, Premier Maurice Duplessis declared that he was fighting the excessive centralization of Ottawa. It was true that federal government authorities had expanded their powers during the Second World War, and this led to a propensity for delving into areas of provincial jurisdiction. On the other hand, the attitude of the Quebec government barely hid a strong conservative and retrograde inclination in issues regarding social progress. After the death of Duplessis in 1959 and the arrival to power of the Liberal Party the following year, Ottawa anticipated an improvement in its relations with Quebec, more so since the new premier, Jean Lesage, was beginning his political career in the national capital. 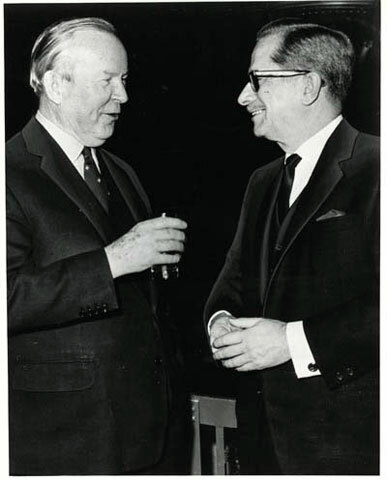 Imagine the surprise of participants in the federal-provincial conference of 1960 when Lesage struck to his guns and demanded more money and power from Ottawa. Lesage was an astute and skilled negotiator, perfectly aware of the mechanisms of the federal government. He obtained a greater portion of the personal income tax that Quebec paid to Ottawa and an increase in equalization payments to the tune of $185 million between 1964 and 1966. The substantial influx of funds was crucial, given the extremely high cost of the reforms initiated by the Liberal Party in Quebec. In the area of federal programs infringing on domains under provincial jurisdiction, Lesage negotiated an opting out right that did not lead to financial loss, a right proposed earlier by Paul Sauvé. By acquiescing to Quebec's demands, Prime Minister Lester B. Pearson sought to show overture to French Canadians. Jean Lesage's successor, Daniel Johnson, wanted to push Quebec's demands even further. 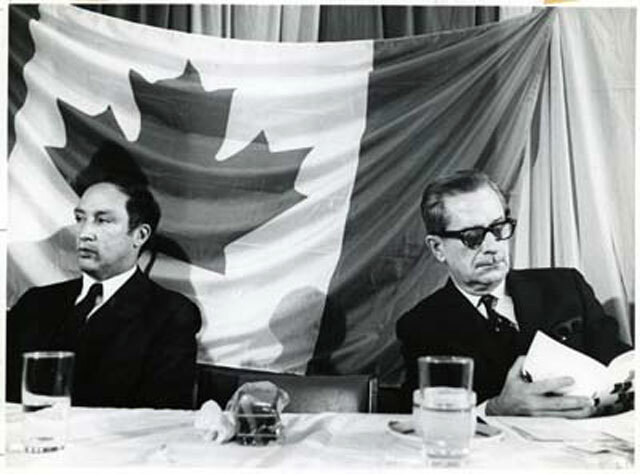 During the federal-provincial conference of 1968, he attempted to obtain special status for Quebec. But the Minster of Justice at the time, future Prime Minister of Canada Pierre Elliott Trudeau, was categorically opposed to the suggestion.